Hennessy embarked on a new in-store kiosk system allowing customers in stores to engage in a new form of self-checkout. This system utilizes the iPad to place an order with a couple of taps. 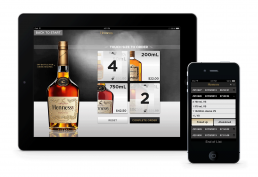 I designed the User Interface which enables users to purchase Hennessy’s V.S. in 4 different sizes with unique touch screen sliders to adjust quantity. A captivating introductory video was created and a recipes lightbox pop-up was added to give a fun and entertaining component to the experience.